Summer is creeping upon us in a terrific way and kids are enjoying their summer vacation. I know how difficult it'd be for parents to manage kids at home during vacation. Engage them to help you in the kitchen to make these delicious ice pops. I'm sure your kids would enjoy making these popsicles. Watermelons are in season now, so why not we enjoy relishing it in a completely new style. Watermelons are low in calories and great to snack for healthy diet. These popsicles are made with lots of watermelon and less sugar. Set them in a special popsicles molds or simply in a ice cube trays like I did. These ice pops can be frozen upto a week. So you can enjoy whenever you crave for slurpy summer thirst. In a blender, puree the watermelon with sugar and lemon juice. Pass to the strainer to remove seeds, if any. Skip this step if you are using seedless melons. Pour the puree into standard ice cube trays. For more convenient option use disposal papercups or to the popsicle molds. Freeze it for an hour. Now insert a tooth pick to the ice molds. Freeze gain for minimum four hours or overnight(until solid) to set. Keep the ice tray in room temperature for a minute to remove ice pops or slightly twist the tray to get pops out easily. Serve and enjoy!! You cannot insert toothpick to the puree when it is in a liquid form, thats why referred to do after an hour that might start to go solid state. 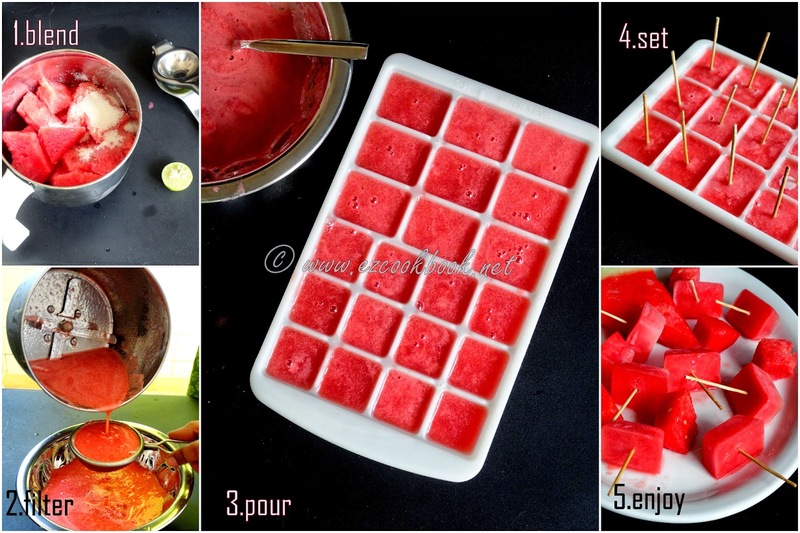 For more yummy options put the watermelon ice pops in your water glass, fill with water to enjoy flavoured water. Adai, is prepared using lentil and rice combination. A protein and carbohydrate rich recipe that is suitable for healthy breakfast. Also add a handful of drumstick leaves or any green leafy vegetable to make it iron rich. The batter of adai is ground thicker and coarser than dosa batter. It is a popular and traditional recipe from Tamilnadu, usually served with Avial(mixed vegetable ) to make a complete meal. Kosambari, a popular lentil based salad also referred as kosumalli or Vada Paruppu. It's very popular as Hesarubele Kosambari and must in Kannadiga Marriage feast menu. It is offered as a naivedhyam to Lord Rama during Shri Rama Navami festival along with Panagam and Neer Moor. Also taken by people who observes fasting during Navratri Festival. One such quick to make salad with all goodness in one bowl, so it can be a perfect meal by itself. Ideal protein rich recipe for weight losers to try for breakfast or brunch. 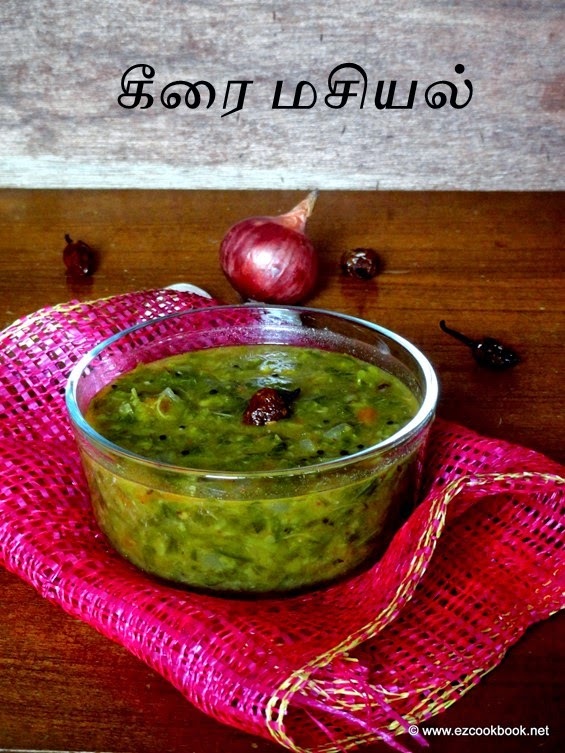 Keerai Masiyal | கீரை மசியல் is one of the easiest and healthiest main dish usually served with rice for lunch time. Its a very comforting masiyal suitable for toddlers and kids. Feed them with rice and dollop of ghee. Its very mild and less spice compare to other main course like sambar, kulambu but more or less similar like Kootu recipe. Any type of keerai can be used to try this masiyal. To make a complete meal serve with rice, kara kulambu, thengai thogayal and appalam. Few things tickles the mind like the smell of early morning baking, brewing coffee and the pleasant chants. It happen to have a pleasant Mother's day with my cutie yesterday. Happiness is having a daughter who is as sweet and reserves my mind completely for her. She assists me the whole time of baking these muffins for morning breakfast. Since all the ingredients I used here were her favourite, she enjoyed every minute through out the array of steps till baking to capture the best moments. And yes these cute little hands did the magic to the muffins. Its delicious, cheesy, melting morning bliss. The best Mother's Day Surprise. 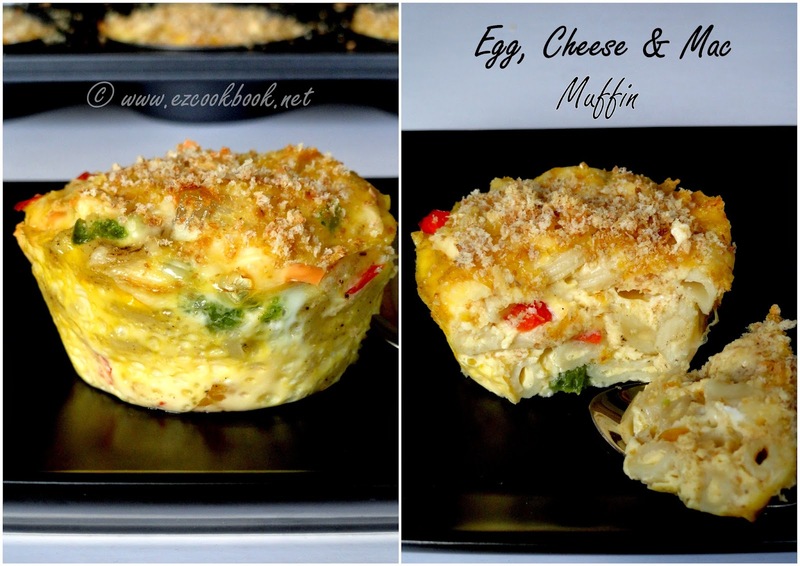 Coming to the recipe for something deliciously different, try out these quick, easy and simple to make savoury egg, cheese and mac muffins. I swear you have nothing to worry about the consisitency, texture and baking mode to follow for this muffin. Simply go head and try your own and treat your loved ones with something special. Cook the pasta in the boiling water, add salt for about 8-10 minutes or until al dente. Drain the pasta and keep aside. Lightly oil the muffin holes with olive oil or cooking spray. Divide the pasta mixture between the muffin holes. Beat the eggs and milk to smooth. Pour this to the muffin hole till reaching brim. Top it up with grated cheese and finally scatter with bread crumbs. Bake in a preheated oven, 180C(350F), for 15-20 minutes until golden(muffin won't raise much). Leave to cool in the tin for 5 minutes, then transfer to a wire rack to slightly cool. I used hollow tube shaped macaroni( type of dried pasta). You can used any pasta variety as you desire,but make sure you use small pasta to fit inside muffin pan. You can use as many veggies as you like. Don't be stingy while adding cheese, use generous amount especially for kids. After tasting the stew once in a restaurant, I completely fell in love with this stew. The warm stew which was served with appam gave boosting to my soul. Ishtu is a traditional Kerala stew which is basically made with potato or meat. Usually I prepare appam with vegetable kurma, which is my Hus favourite breakfast recipe. But after trying the combo he too started demanding me to try it at home. I found this recipe in a small booklet of my collection, seems to be quite interesting. The kerala stew with no tempering of bright mustard, cumin seeds and with no red spicy feel, gave me a big relief to feed my kid without any complaints. The stew itself had the subtle flavours of ginger, chilli and the warm coconut flavour driven me completely to finish my plate in a snap of time. I even prefer to have it as a soup rather than with appam. Tabbouleh salad is classic and fresh Mediterranean salad which is very famous in Middle east. It is served as side dish along with pita bread, hummus and many more. It is made from fresh veggies, bulgur and herbs like mint and parsley leaves. This combination makes it so flavourful and healthy that I make it many times a one pot meal. Try this simple and easy to follow recipe to make this delicious Lebanese Tabbouleh Salad. Whenever I am looking for a very healthy and quick to make brunch very famous Bombay club sandwich always comes in mind first. Bombay club sandwich is basically a grilled or toast sandwich with fresh veggies. It is very famous street food in Bombay and easily available in every corner of the city. The combination of fresh veggies and specially made green chutney make it absolutely unique and filling. Check out the recipe below to make this delicious Veg Grilled Sandwich | Bombay Club Sandwich. 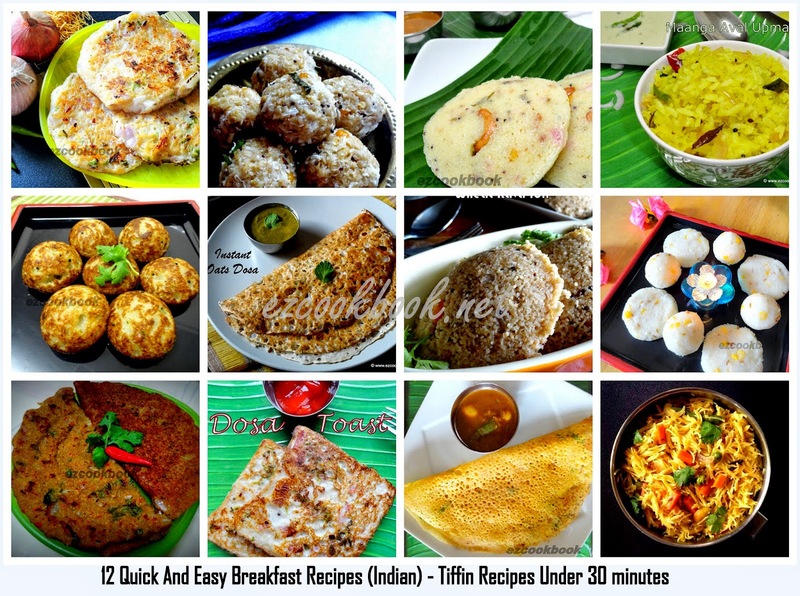 Here we have listed some of the easy and quick to make south Indian style breakfast or tiffin recipes. Also it can be a better option for weeknights dinner. All these recipes will take under 30 minutes to get done. Trust me any of these recipe doesn't call for any pre-preparation process. As time is a crucial factor for everyone to thing prior ahead and plan for cooking. And this is what most of the working women wanting for ? They look forward to recipes that takes no much of their precious time but preferably homemade rather then takeaway foods. More over everyone loves to cook fuss free recipes under less time. I had received many request from mothers to suggest for some quick to make recipes, as they are bored with regular tiffin varieties and are even being criticized by hus and kids for same idli, dosa, chappati, appam, poori and pongal. All the recipes given here are unique from regular South Indian breakfast recipes. Serve it with chutney and sambar of your choice or simply with podi too. Hoping that these handful of recipe ideas avail you the best in the everyday cooking. Preparing recipe for breakfast is really a daunting task for me and I guess many of you struggle with the same problem in your everyday routine. Don't worry today I come up with quick and instant Dosa kind of recipe but totally different preparation from regular batter. Its completely made with vermicelli and I added curd for instant sourness with green chilli for spiciness. So don't you feel it sounds so simple with very basic ingredients readily at home and still waiting for what? Try out immediately and send us your experience. This can be prepared for dinner too. Poha is always a handy ingredient in my kitchen, as it makes delicious meal instantly and it blends well with any combination. I personally finds it to be an easy option for making tiffin recipes. Usually we all have tried mango rice, but never thought of with Aval/ Poha rite. Infact this upma is much more easiest choice that takes less than 15 minutes. I'm sure that this maanga aval would defiintely going to be hit at home. A quick and delicious breakfast made in all south Indian homes is Rava Idli. This is instant and also tasty with sambar and chutney. However traditional Idli would take two days of preparation process, this rava idli is quick and easier. This breakfast recipe is very popular and origin from karnataka(Udupi cuisine) state of India. This is very famous now in allover part of India and everyone likes to try other cuisines popular recipes. If you want to prepare a dish in a jiffy with less effort then try out the same way I did with bread. Believe me this will be tasting very crispy. If you got so much bread loaf sitting Idle in the table and got bored with sandwich then work out with either Paniyaram or Pancake both are tasting same and excellent. Discover the procedure for making this yummy paniyaram and bookmark it in you PC to make some Instant recipe for Dinner at times. Broken wheat rava also known as samba godhumai rava is a very healthy choice for a light breakfast or meal. Generally if something is made of a healthy ingredient doesn't attract many people but this broken wheat idli will definitely make your breakfast or dinner a sumptuous one. Serve it with sambar or chutney of your choice and love the taste. Making is also so easy and quick so that you will love making it often. Kudumulu also referred as Undrallu(steamed rice dumpling). Its a famous delicacy from AndhraPradesh (southern part of India). This is a healthy breakfast recipe. An excellent steam cooked food with very mild flavor and taste which goes well with any spicy chutney or pickle. This Kudumulu is a savory version rice balls with combination of rice and chena dal. Very simple and delicious recipe that can be made faster with good source of carbohydrate and protein. A Perfect food for kids. Sambha Wheat / Godhumai Rava is enriched with full of fibers and proteins. Its a perfect ingredient that can be used for all age group. This wheat rava can be used to prepare many dishes due to its health benefits. We thought of sharing with some of the recipes which we use to prepare regularly at home to avail you the best ideas. I got some Dosa batter but bored with same old recipes, so I thought of preparing some quick snack with bread using this leftover batter and that's how I tried this instant Dosa Toast and my tummy started smiling with yum yum…..try this for dinner. If you got either less batter or more bread leftover can etilize this procedure to finish it..... This is such a tasty and jiffy to make snack with less ingredients. One of the easiest and tasty breakfast I often use to make is Oats Undrallu. I even thought of posting this recipe earlier, but couldn't get pictures. This time I made it and captured without fail. I should point out here, this is one such simple savory dumpling for those who are seeking healthy eats. It just takes only 15 minutes of your precious time to get done. A quick filling dumpling that can easily go in kids snacks box. I always love to make dinner faster and quicker so that I can spend some leisure time with my family. My daughter and me loves dosa a lot. Never mind of any variety of it, but this instant version of dosa is really a super hit with all my family members. Every time I make this dosa comes out well with crispy and tasty, for this I should thank my Ammama(grandma) because she only taught me this dosa recipe. 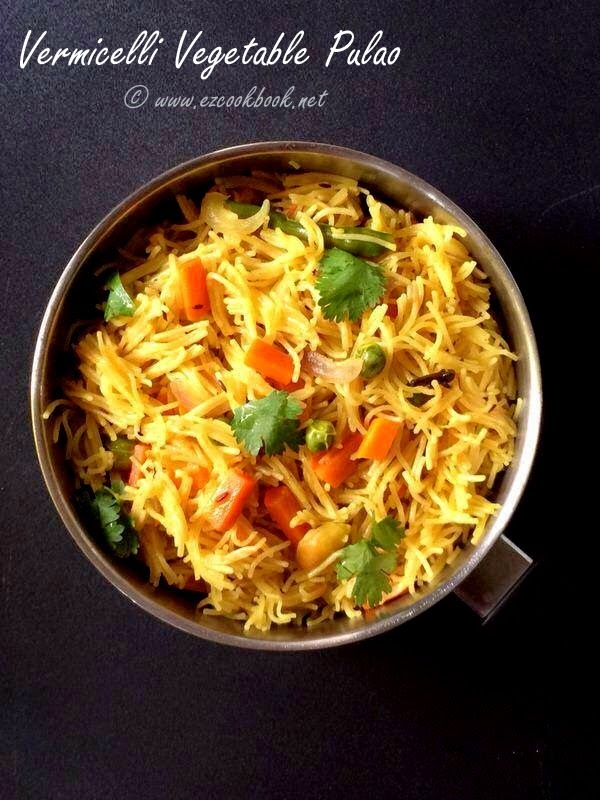 Vermicelli pulao loaded with goodness of rainbow of vegetables that are palateable. Easy and quick to make under 30 minutes. Perfect tiffin to pack for kids lunch box with fruits. Hope all these simple recipes can make your cooking more interesting and easy now onwards. Feedbacks are welcome and share your ideas with us. Check out the Traditional Breakfast Platter of south India.